WhatsApp rolled out push-to-talk voice messages back in 2013, but the Facebook subsidiary has done little to improve the feature since then – until now. The popular messenger is experimenting with a feature to record voice messages without having to hold that irritating button, WABetaInfo has noticed. 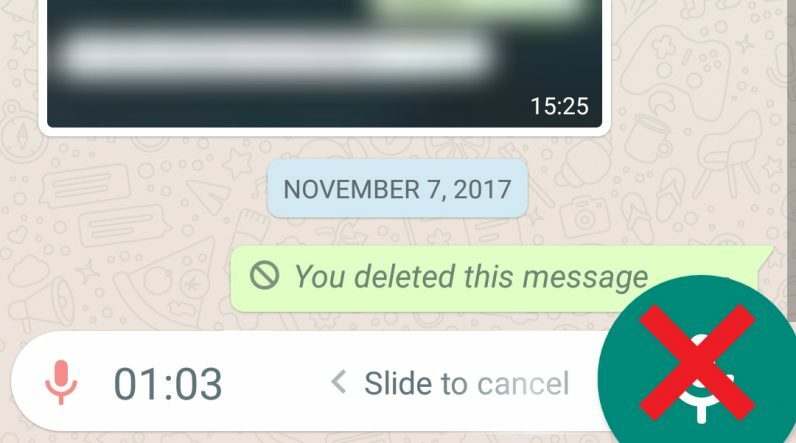 Here is how it will work: once you start recording a voice message, WhatsApp will display a new sliding interface for the microphone button. After approximately half a second, users will see an option to swipe up to lock into recording mode, allowing them to speak to their phones without holding the button. Perhaps most handy is the ability to browse through your previous messages while talking – in case you need to double-check what you’re talking about or make a reference to a previously discussed point. Now, there are some restrictions when using the swipe-to-talk functionality. For one, you won’t be able to view images or videos while in lock mode (though iPhone users could take advantage of the 3D Touch feature to pre-view them). It’s also impossible to type out texts in locked mode. Another limitation is that you can’t turn to other chats while in locked mode; doing so purportedly causes the recordings to get automatically deleted. Meanwhile, those curious to see how the revamped swipe-to-talk voice messages can check out this demo video obtained by WABetaInfo. The popular WhatsApp insider says the feature is currently being tested, but should become available in upcoming updates, once the company has managed to get it to work smoothly. But in case you are too impatient to free up your hands, you might want to give this trick a shot – though you will need Google Assistant to pull it off.